If you work in finance, you will run into the challenge of estimating the cost of capital for a company sometime during the course of the year. 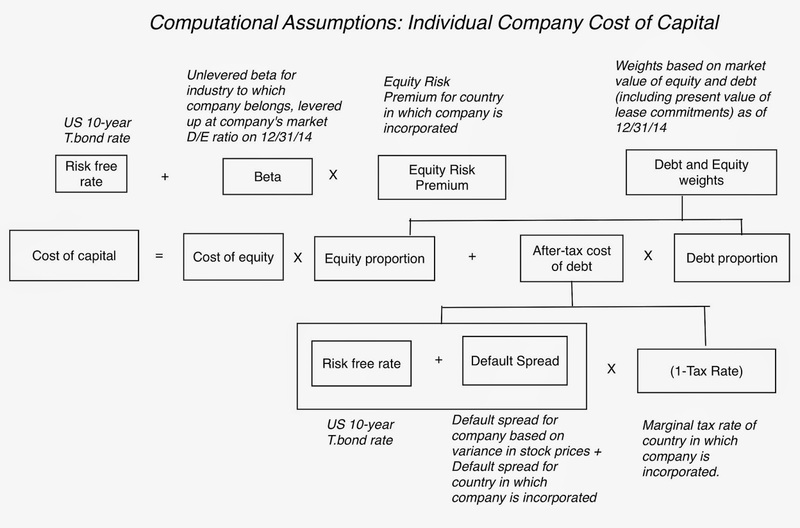 I hope that the datasets that I have created are useful to you in that endeavor and if you decide to use them, here is a simple template for arriving a company’s cost of capital in the currency of your choice. 1 Risk free rate Use the prevailing 10-year US T.Bond rate as the risk free rate in US dollars,even if you plan to compute the cost of capital in another currency. Fight the urge to normalize, tweak or otherwise mess with this rate. It is what you can make today on a risk less investment, no matter what your views on it being too low or high. 3 Financial Risk (Debt to equity and levered beta) Lever the beta using the market debt to equity ratio for the company today. (If you prefer to use a target debt to equity ratio, make sure it is based on market values. Market value of equity: Use the market capitalization as market value of equity. 4 Equity Risk Premium Obtain the geographical breakdown of the company’s revenues (or other operating metric, if you don’t like revenues). Take a weighted average of the ERP of the countries/regions that the company operates in. Geographical Breakdown: The company’s revenues will be in its financial statements, though it is not always as clear and detailed as you would like it to be. 5 Cost of debt If you can find a corporate bond rating for your company, use it to get a default spread and a cost of debt. If you cannot find a bond rating, estimate a bond rating for the company and a default spread on that basis. If you are doing the latter, add a default spread for the country to get the pre-tax cost of debt. Bond Rating: If available, you should be able to find it at S&P or online. 8 Currency change If you want to convert the US dollar cost of capital into another currency, add the differential inflation rate (between that currency and the US dollar) or better still, scale up the US$ cost of capital for the difference in inflation. The inflation rate in the US can be estimated as the difference between the US 10-year T.Bond Rate and the US TIPs rate. For other countries, you can use the actual inflation rate last year as a proxy for expected inflation. A rising (falling) tide lifts (lowers) all boats: The first reaction that most analysts and CFOs will have to my estimates of the cost of capital is that they look too low, with a median value of 7.40% for US companies and 8.32% for global companies. In fact, the longer that you have been around in markets, the lower today’s numbers will look like to you, because what you consider a normal cost of capital will reflect your experiences. The low costs of capital, though, are appropriate, given the level of risk free rates today. 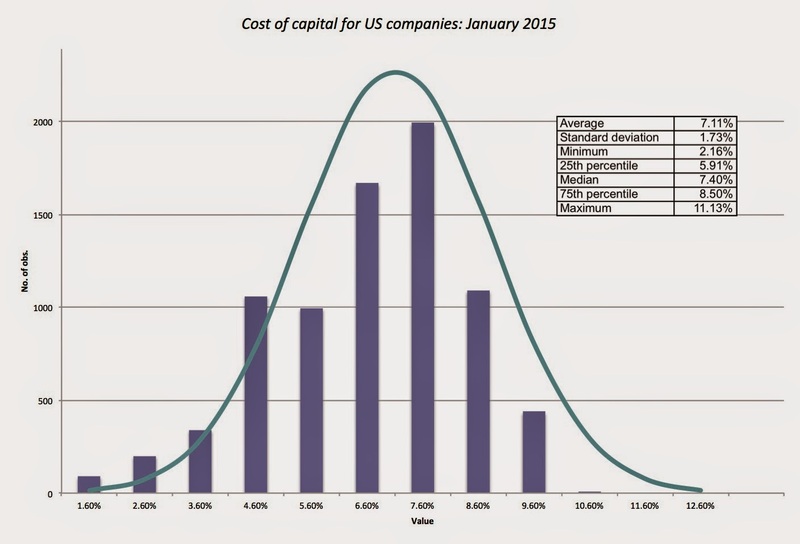 The cost of capital does not (and should not) reflect all risk faced by a business: Even if you accept the proposition that the costs of capital are lower because of low risk free rates, you may still feel that the costs of capital don’t look high enough for what you view as the riskiest companies in the market. You are right but that is because the cost of capital captures risk to a diversified investor in a going concern. Consequently, it will not reflect risks that are sector-specific but not market-wide, such as the risk to a biotechnology company that its newest drug will not be approved for production. Those risks are better reflected in the expected cash flows. 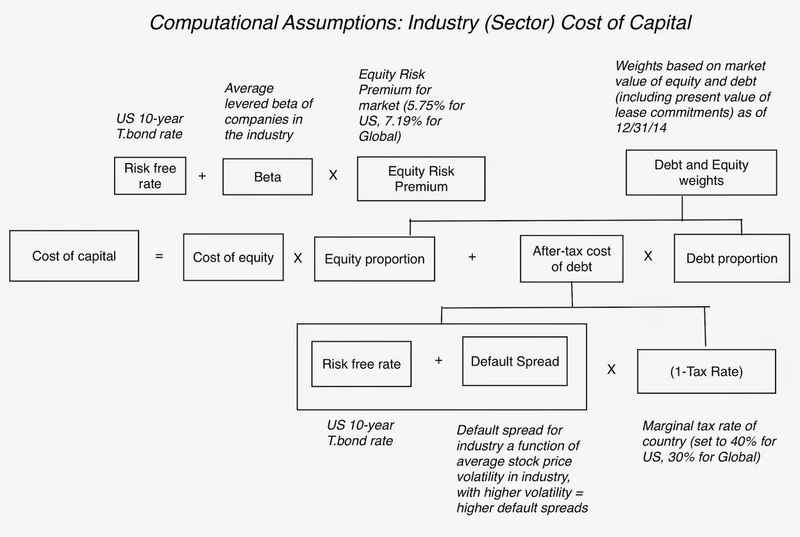 The cost of capital also does not reflect truncation risk, i.e., that a firm may not survive the early stages of the life cycle or an overwhelming debt burden. That risk is better captured through decision trees and probabilistic approaches. Don’t sweat the small stuff: In my view, analysts spend too much time finessing and tweaking the cost of capital and not enough on the cash flows. 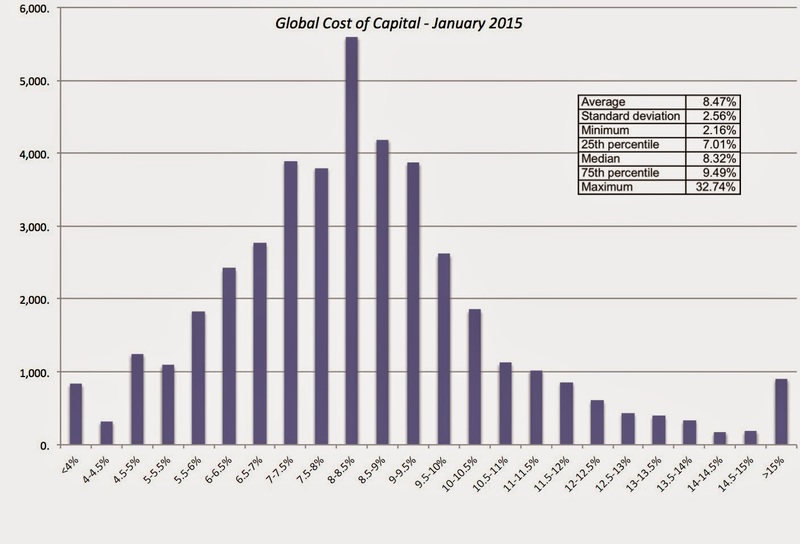 After all, the cost of capital, even if you go with the global distribution, varies within a tight range (6% to 12%, if you use the 10th and 90th percentile) and your potential for making mistakes is therefore also restricted. In contrast, profit margins and returns on capital have a much wider distribution across companies and getting those numbers right has a much bigger pay off.